I've used the terms 'personal and 'personalized' learning to stand for what Yong Zhao is credited with calling 'personalized' and 'individualized' learning. No matter the terminology, the concept is key. What you want is "having students go through their own paths to whatever endpoint they desire. How you take the path and where you end up is totally dependent upon the strengths and interests of the learner." I find a lot of educators say "I agree with this, but..." and then insert some condition where they assert control. 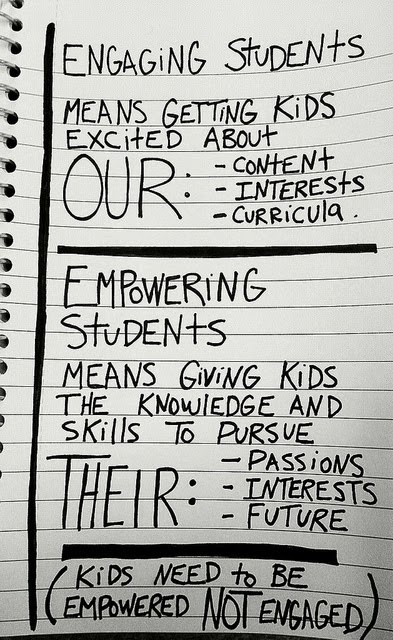 Even George Couros inserts "creating a difference for myself and/or others" into his definition of "empowered" in this post. No. Being empowered means being able to work on something even if you don't think it creates no difference at all (I have a ton of projects like that!). If you want people to define their own future, then it's not "empowered (with conditions)". It's simply "empowered". Last Updated: Aug 21, 2018 2:01 p.m.